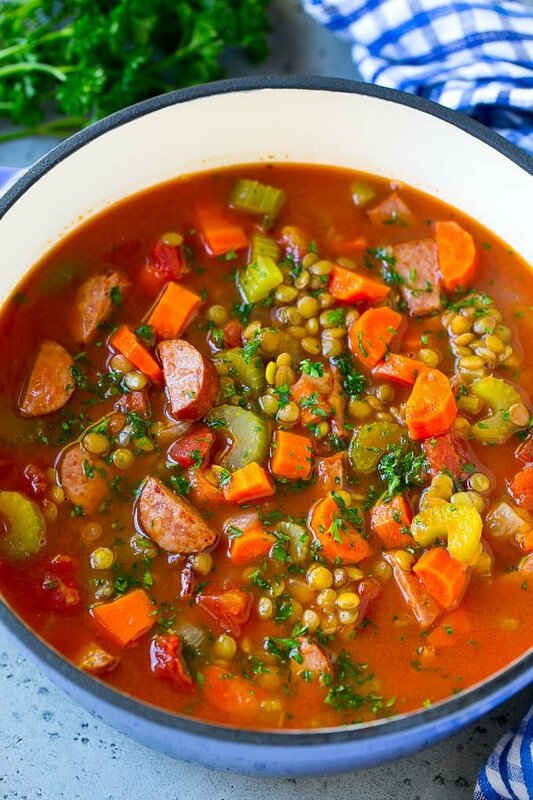 This hearty lentil soup is made with smoked sausage, vegetables, tomatoes and lentils, all simmered in an herb broth. An easy one pot dinner option that the whole family will love! In my opinion, you can never go wrong with soup. Whether it’s a slow cooker chicken tortellini soup or a savory stuffed pepper soup, it’s always a hit in my house. This lentil soup is full of flavor, color and texture and is a total crowd pleaser. I try to incorporate lentils into my family’s diet when possible. Lentils are full of nutrition, inexpensive and packed with protein. 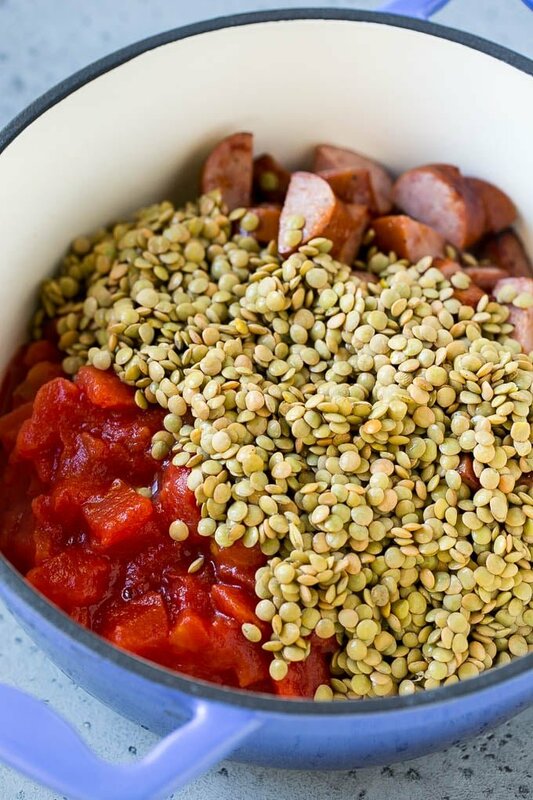 A veggie packed lentil soup is our favorite way to enjoy lentils, the smoked sausage really makes this one special! How do you make lentil soup? 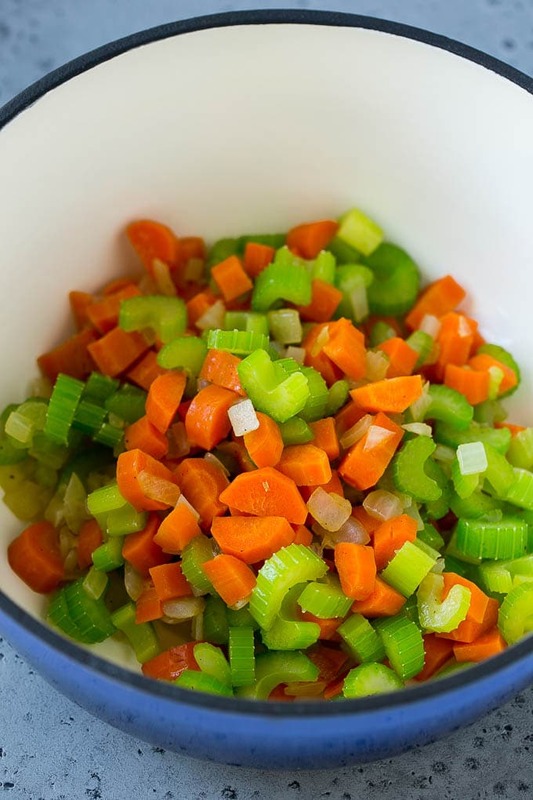 This soup starts with carrots, onions and celery cooked in a little olive oil. 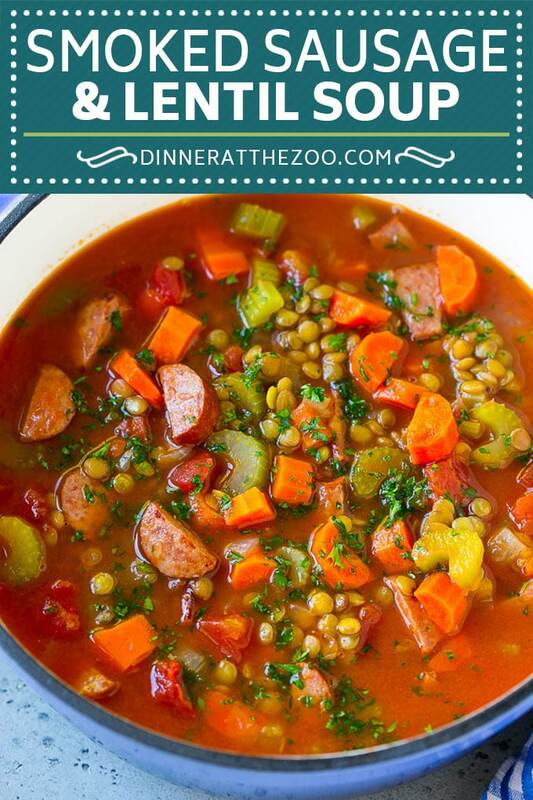 The veggies are combined with smoked sausage, brown lentils, chicken broth, tomatoes and herb. The soup simmers until the lentils are tender, then it’s time to eat! Do you have to soak lentils before cooking them? Unlike other dried legumes, lentils are quick cooking. They are typically ready to eat after a 20-30 minute simmer. Therefore, you do not have to worry about soaking your lentils before you cook them. That being said, good to give them a quick rinse before they go into the pot! Lentils are chock full of folic acid, iron, potassium, manganese and Vitamin B6. They’re also relatively low calorie, high fiber, and loaded with protein. 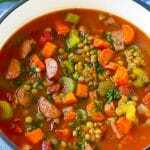 Lentils are a great choice for a healthy diet, especially combined with the veggies in this soup. I use the rope style pre-cooked smoked sausage for this soup. I typically use turkey sausage because it has less fat and calories, but still has plenty of flavor. This recipe calls for brown lentils, which are the most common lentils that can be found in all grocery stores. If you prefer, you can use green lentils. I wouldn’t use red lentils for this recipe, as they tend to get mushy and not hold their shape. Lentil soup is the perfect candidate for the freezer. Place your soup in a resealable freezer bag and freeze for up to 2 months. Lentil soup can also be made in advance and stored in the fridge for up to 2 days before you plan to enjoy it. I like to serve lentil soup with a side of bread, such as garlic knots or honey cornbread. Looking to make a meatless lentil soup? 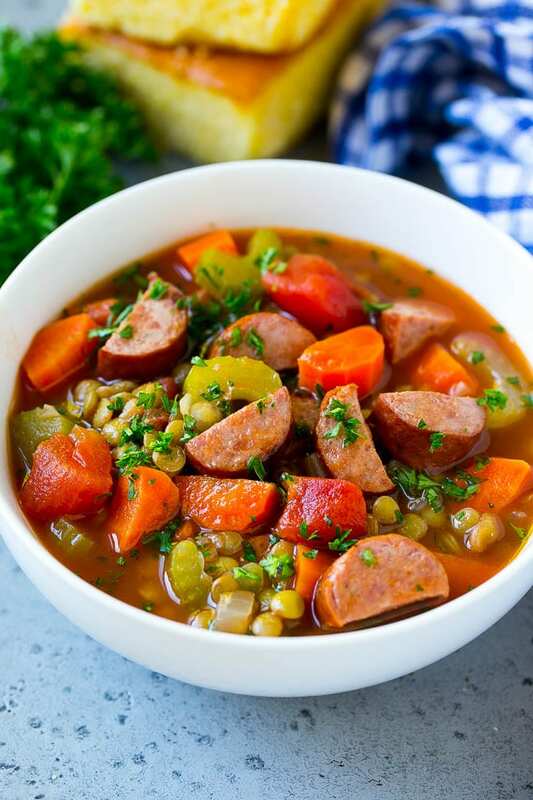 You can easily adapt this recipe by omitting the sausage, adding an extra 1/2 cup of lentils, and using vegetable broth instead of chicken broth. I’d recommend adding a teaspoon of smoked paprika to the soup so that you still get that great smoky flavor without the meat. Lentil soup can easily be made in the slow cooker. 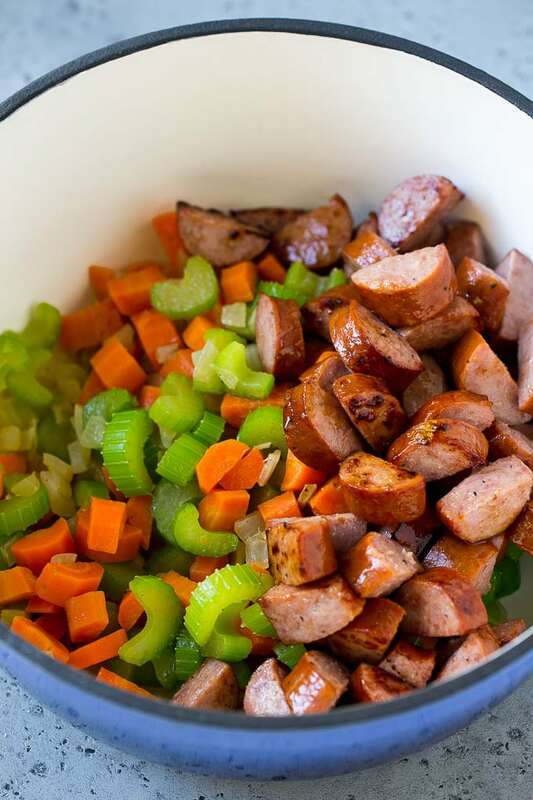 Simply saute your vegetables and sausage, then place everything except for the parsley in a slow cooker. Cook on low heat for 3-4 hours or until lentils are tender. I make this soup constantly during the colder weather months – it’s quick to put together, relatively healthy and totally delicious! Heat the olive oil in a large pot over medium heat. Add the onion, carrots and celery and cook for 4-5 minutes or until softened. Add the sausage and cook for 2-3 more minutes or until just browned. Add the garlic and cook for 30 seconds. Add the chicken broth, diced tomatoes, tomato paste, Italian seasoning, lentils and salt and pepper to the pot. Bring to a simmer. Cook for 20-25 minutes or until lentils are tender. Sprinkle with parsley and serve. 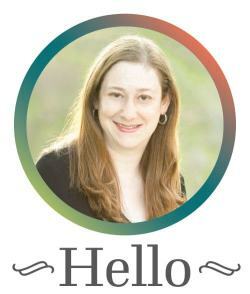 So happy to hear you enjoyed it, thanks for reporting back!